Is somebody going to help me carry this movie? Running Time: 1 hr. 57. min. It’s always jarring while watching the Turner Classic Movies network to stumble across an old film populated by a cast steeped in traditional stage acting, yet with one young outlier emoting Method, Meisner or some other modern acting technique—think the early films of Montgomery Clift, Marlon Brando and Gregory Peck. 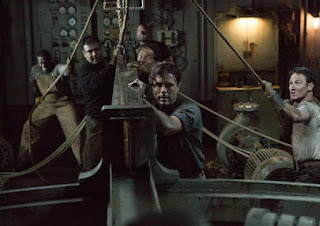 At the risk of overstatement, a similar sensation washed over me seeing Casey Affleck in The Finest Hours, based on Michael J. Tougias and Casey Sherman’s book chronicling the true story of a daring Coast Guard rescue off the coast of Massachusetts in 1952. On February 19 of that year, two oil tankers, the SS Fort Mercer and SS Pendleton, were split in two by a fierce nor'easter. The film focuses on the Pendleton rescue by a Coast Guard lifeboat out of Chatham, Massachusetts. Directed by Chris Gillespie, the narrative oscillates between the rescuers, led by coxswain Bernie Webber (Chris Pine), and the survival efforts by the Pendleton crew, a fractious lot held together by assistant engineer Ray Sybert (Affleck) striving to keep the stern section of the ship afloat long enough for help to arrive. The fractured screenplay never gels its three fronts, which also includes Webber’s fretting but resolute fiance Miriam (Holliday Grainger) alongside some inexplicably neurotic townsfolk back on the mainland. Meanwhile, the rest of the “Coast Gaahd” crew grapple with dueling bad accents, from Pine and Ben Foster’s warbly Boston brogue to Eric Bana as Chief Warrant Officer Daniel Cluff, whose Virginia-born drawl seemingly takes a detour through backwoods Alabama. Indeed, the overall portrayal of Cluff is thorny, as the decorated WWII boatswain is cast as stubborn and uninformed during an ill-fitting face-off with Miriam for ordering Webber and his crew on their treacherous rescue mission. Amongst it all, Affleck appears to be occupying in an entirely different, better movie, far from the amber-soaked, saccharine performances of Pine, Grainger and the rest of the cast. While everyone else dutifully recites their uninspired dialogue, Affleck proceeds at his own pace and cadence. In the process, he somehow crafts a fully formed character. Gillespie’s GGI visuals are suitably harrowing in a Perfect Storm sort of way. 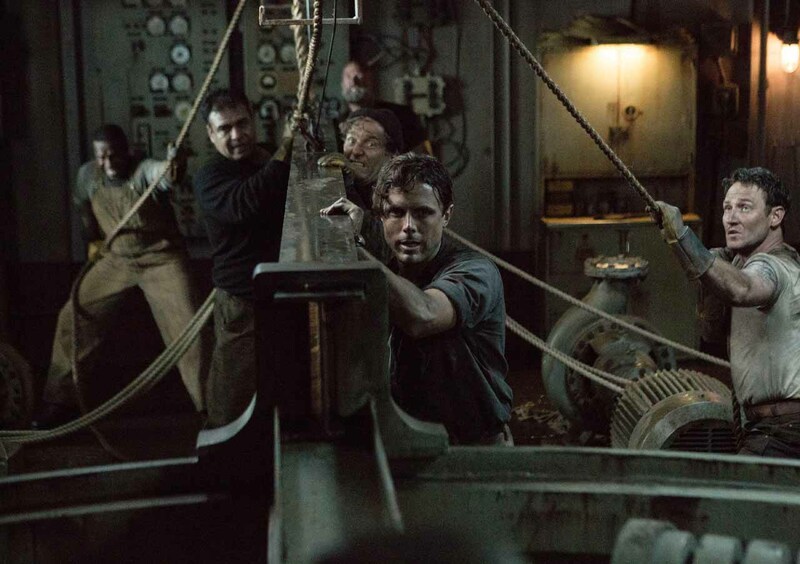 But The Finest Hours is at its finest only when Affleck is on-screen. Unfortunately, that’s not long enough.